He will have to take out a mortgage in order to buy the house. They hope to pay off the mortgage on their home soon. She mortgaged her house in order to buy the restaurant. I've mortgaged all my free time this week to the hospice and won't be able to come to the party. These example sentences are selected automatically from various online news sources to reflect current usage of the word 'mortgage.' Views expressed in the examples do not represent the opinion of Merriam-Webster or its editors. Send us feedback. Mortgages are like any other financial product in that their supply and demand will change dependent on the market. For that reason, sometimes banks can offer very low interest rates and sometimes only they can only offer high rates. If a borrower agreed upon a high interest rate and finds after a few years that rates have dropped, he can sign a new agreement at the new lower interest rate -- after jumping though some hoops, of course. This is called "refinancing." Mortgages make larger purchases possible for individuals lacking enough cash to purchase an asset, like a house, up front. Lenders take a risk making these loans as there is no guarantee the borrower will be able to pay in the future. Borrowers take risk in accepting these loans, as a failure to pay will result in a total loss of the asset. Home ownership has become a cornerstone of the American Dream. For most people, their home is their most valuable asset. Mortgages make home buying possible for many Americans. Mortgages are not always easy to secure, however, as rates and terms are often dependent on an individual's credit score and job status. Failure to repay allows a bank to legally foreclose and auction off the property to cover its losses. A balloon mortgage is a mortgage with a large payment made near or at the end of a loan term. Unlike a loan whose total cost (interest and principal) is amortized -- that is, paid incrementally during the life of the loan -- most or all of a balloon mortgage's principal is paid in one sum at the end of the term. That sum is called the balloon payment (or sometimes the bullet). Sometimes the interest is collected as part of the balloon payment as well, though in many cases the loan is interest-only during the term of the loan with only the outstanding principal due at the end. For example, suppose someone takes out a mortgage for $417,000. To avoid a lengthy graphic with 360 payments for a 30-year mortgage, we'll assume that the mortgage is only two years long (this is an unrealistic loan term, but it works for our purposes). In a normal mortgage scenario (the left side of the graphic), the borrower would make a series of equal payments that are composed of principal repayment and interest payment so that by the end of the loan term, the borrower has paid down all of the loan. For a balloon mortgage (the right side of the graphic), however, the monthly payments might be extremely low for most of those two years—because at the end of the two years the borrower has to make a giant balloon payment to pay off the loan. Balloon mortgages can be common, and they have the advantage of lower initial payments. They can be preferable for people who have near-term cash flow issues but expect higher cash flows later, as the balloon payment nears. The borrower must, however, be prepared to make that balloon payment at the end of the term. Sometimes the lender will roll that amount into a new mortgage for the borrower. This is often called a two-step mortgage. A junior mortgage is a loan secured by the equity in a house. Equity equals the value of the house less the balance owed on the homeowner's first (or in some cases, preceding) mortgages. Junior mortgages are not the same as home equity lines of credit (HELOCs). Junior mortgages are very similar in concept to traditional mortgages. For example, junior mortgages generally must be repaid over a fixed period. 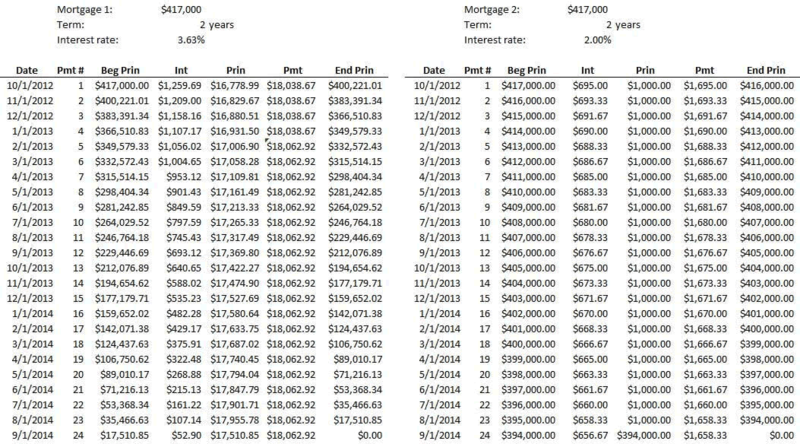 Some lenders may offer fixed rates on these loans; others might offer variable rates. Like first mortgages, most banks will also charge points and other fees for generating the junior mortgage (attorney fees, title fees, insurance and documentation fees, for example), and these costs vary by bank. In some cases, the lender might charge a fee if the borrower prepays the loan. And because the loan is secured by a house, if the borrower defaults, the lender may foreclose on the house. Junior mortgages can be viable options when compared to credit cards or other high-interest, unsecured loans. In addition, mortgage interest is tax deductible, making the interest rates on junior mortgages sometimes lower than they appear when one considers the tax savings. However, not all junior mortgages are created equally. Borrowers are well served to compare fees, interest rates and repayment terms among lenders. After all, when a borrower defaults, his or her home could end up belonging to the bank for good. 1a : a conveyance of title to property that is given to secure an obligation (as a debt) and that is defeated upon payment or performance according to stipulated terms shows that a deed was intended only as a mortgage— W. M. McGovern, Jr. et al. What made you want to look up mortgage? Please tell us where you read or heard it (including the quote, if possible).